PRESERVE FOOD LONGER - Store fresh or frozen food 2-3 times longer to reduce waste! Stop buying ingredients you already own! Write on our bags with a SharpieTM marker and save time and money in your cooking and shopping. CREATE HEALTH PORTIONS - Prepare meals in advance for busy weeknights or ensure you don't overeat that snack mix! Pack up and freeze your leftovers instead of letting them go bad in your refrigerator. Portion out nuts, cheese, meat, candy, pasta...anything you want to have a little more control over. STAY SAFE - These vacuum food bags are made of a high-quality, FDA approved materials. They are non-toxic, BPA-free and do not contain any harmful or allergenic substances. SAVE MONEY - Our vacuum seal bags are 50-60% less expensive than otherwise identical brand name bags. Double the value of your hard earned dollar! NOT JUST FOR FOOD - Use in a variety of ways! 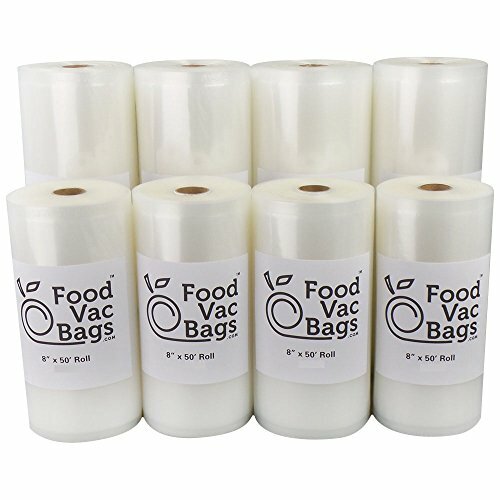 FoodVacBags are perfect for cabinet, fridge or freezer use, boiling, sous-vide cooking, and more. They are also microwavable and dishwasher safe, so you can reuse them! They protect everything from the harmful effects of moisture and oxygen - coins, comic books, jewelry, documents...even photos! Protect your memories longer.